1. THE COMMON SENSE RULE: The BronzeBack Classic is about getting people-powered water crafts out in the name of fun and competition! Our goal as host is to work hard to ensure a fair and balanced playing field. With that being said, if any of the rules need altering to ensure the safety of all participates we reserve the right to alter them at any time, without formal notice. To stay up to date with rules, prizes and general information please reference CWOutfitting.com and our Facebook page. 2. WHO CAN ENTER: Anyone with or without (we rent them) a canoe, kayak or SUP board and wants to experience some awesome fishing, scenery, and camaraderie. This excludes any use of a trolling motor and any other mechanical motor. 3. REGISTRATION AND FEES: We wanted to provide a low cost tournament with extra special service, food, prizes, and fishing action. Price includes entry fee, shuttling of people and equipment, staff to assist with getting on and off the river, participation gift, cash prizes and merchandise prizes for at least 4-6 places, door prizes, awards ceremony with a great meal, and equipment rentals available if you pay the extra amount. Our goal is for all participants to take home prizes. See tournament web page for costs including early bird registration cost and deadline. Angler without canoe or kayak = rentals available at discounted price. See tournament web page. We have various types of fishing kayaks and canoes. Special requests can be accommodated based on inventory and availability. Availability of equipment is limited and will be reserved first come first serve. Payment can be made on the CWOutfitting.com web site by credit card or in person at our shop with credit card, check or cash at any time before the Friday night pre-registration meeting. The tournament is limited to 42 shuttle participants and 50 total participants. You must pick your wave starting time & type of rental water craft before the Friday Evening Pre-Tournament meeting. Full payment, registration forms, signed waiver, and obtaining special icon must be completed to participate. 4. SCHEDULE: Please visit the tournament web page at cwoutfitting.com for full details. 5. ELIGIBLE WATERCRAFT: These are predominately propelled by man power and the use of the river’s natural propulsion, the current, to get the job done (no electric or gas powered motors). At this time we are only allowing kayaks, canoes, and Stand Up Paddle boards. If you feel your watercraft is not listed but should be eligible then you will need to clear it with the tournament director at CW Outfitting before you enter. 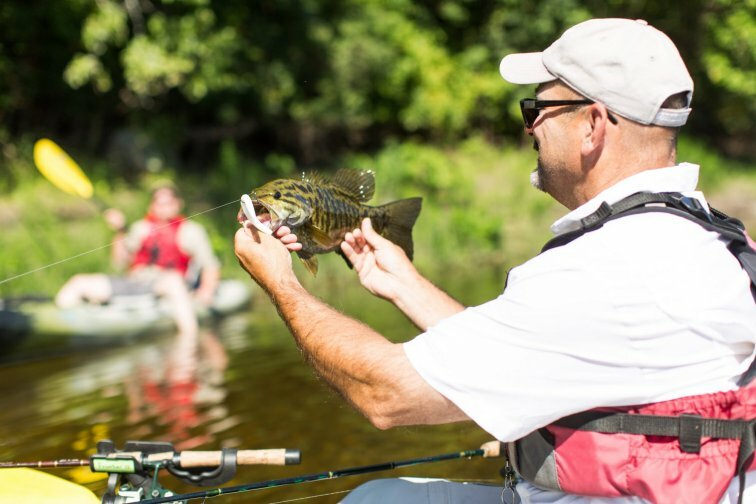 Anglers can share a two person watercraft so long as both are entered into the tournament and equally share in the propelling of the watercraft. 6. ELIGIBLE WATER: This is a MISSISSIPPI River Smallmouth Bass tournament. No lake fishing and no other rivers. Participants choosing to use the CW Outfitting Shuttle will arrive at CW Outfitting before their scheduled wave time. Then they will either launch at CW Outfitting at river mile marker 913.25 and fish to Snuffies Landing at river mile marker 905.25 (approximately 8 river miles - see map) or be shuttled up river to the River Bluffs landing at river mile marker 922.5 and fish back down to CW Outfitting at river mile marker 913.25 (approximately 9.5 river miles see map). Participants choosing their own shuttle can fish any Mississippi River stretch within 60 min of Clear Waters Outfitting provided they follow all other rules. Wade fishing is permitted provided the competitor uses his kayak to access the fishing location. 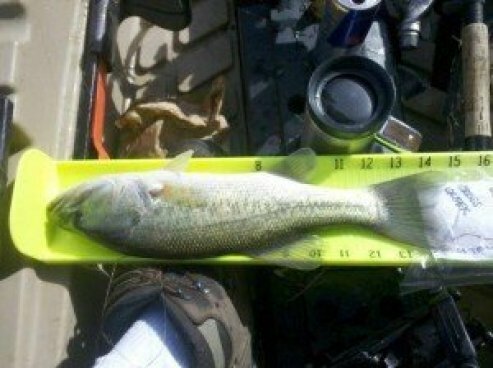 Bass caught while wading or walking the shoreline ARE eligible for submission; however, each competitor must be within sight of his kayak while fishing, and the kayak must appear in every bass photo submitted. Competitors may depart the boat to catch and land fish or to make the boat more accessible to fishing waters. If a competitor must go out of sight of his kayak for any reason (e.g., for a restroom break or to contact a tournament official by phone or other means, or to report an emergency), he must cease fishing until he returns to his kayak, at which time he may resume fishing. 7. 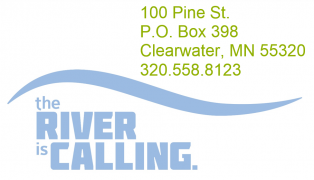 PRE-TOURNAMENT MEETING: Will be held at Clear Waters Outfitting, 100 Pine St, Clearwater MN, 55320 on the Friday night before the tournament, time will be posted on CWoutfitting.com web site. It is highly recommended that all participants attend this meeting to check in and obtain important information. If you cannot make this meeting YOU MUST contact the tournament director at CW Outfitting ahead of time to coordinate getting your special icon and tournament packet prior to the first wave start time. Due to sensitivity and to maintain a level playing ground, packets and icons will not be released before the meeting. What is covered at the pre-tournament meeting? Review and signing of liability waiver. 8. SCORING: We are using the “Catch-Measure-Photo-Release” method. That is once you catch the fish, use a digital camera or smart phone to take a photo of the fish on the standard measuring device with special icon, then release the fish back to the water. For approved measuring devices go to the “Photo Rules” located below. We prefer participants sign up (free) to use the TourneyX scoring system. It will auto cull your catches and display live scoring during the tournament. It will also allow you more time to fish since you would not need to be back to the tournament officials prior to your deadline. If you are not able to use TourneyX, you can also email photos or use a camera with removable storage (i.e scandisk or memory card). If you go with a removable storage option, please bring appropriate cable to sync with officials laptop. If you email photos or submit via removable devise, you must go through your pictures and ONLY submit your top 4 fish for scoring. The “special icon” for the tournament must be present in photo to qualify for scoring. All fish must be released back into the river. The tournament officials will review all photos to verify validity and length of fish for determining place winners. Anglers may score up to 4 Smallmouth Bass. Fish are scored based on length (inches) and the longest combined length will take first place, second longest combined length will take second place, and so on. There is a 10-inch minimum length for fish to be eligible. 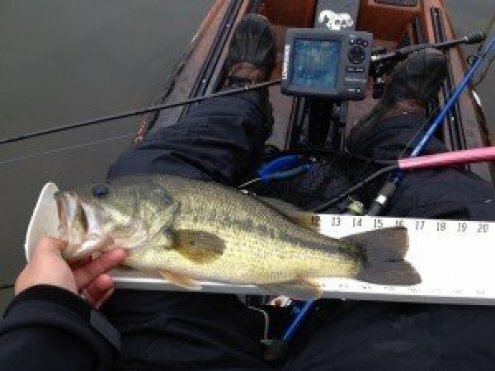 The bass’ nose or lip must be touching the front of the measuring device and this must be visible in the picture. The tail can be “pinched” or “natural” and the mouth can be open or closed. The bass must be facing to the left when measuring. 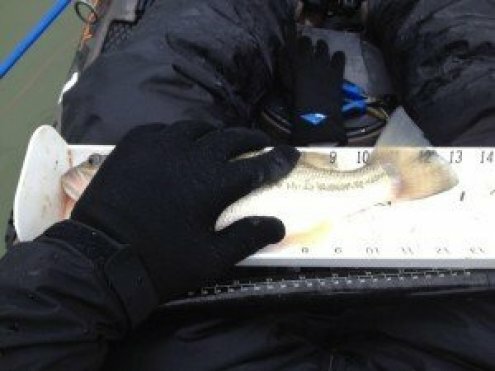 The bass must be on an “approved” measuring device with the front of the device, and the measuring scale beyond the tail, shown in the photo. Be sure the longest point of the tail is laying over a measuring scale mark so it is visible in the picture. A list of approved measuring devices can be found on the web page. 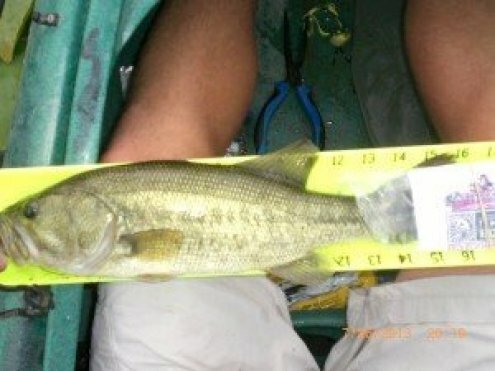 Submitted fish measuring the same length must have distinct differences in appearance or angler may be disqualified. Length is rounded to the nearest quarter of an inch. The tournament is set up so that each participant will have about the same amount of hours to fish. However, due to variations in shuttling and angler preparation time, the time per wave may vary slightly. Variations will not change photo submission times and you MUST submit your photos by your deadline or penalties will apply. You will pick your wave when you enter the tournament. See the tournament web page to see wave times. You will have a photo submission deadline that must be adhered to. The deadline time means your photos are RECEIVED by the tournament officials by that time. Not the time your fish was caught or your picture was sent. Do not wait till the last minute to submit and assume the officials have your photos. Please plan accordingly. If your submissions arelate there will be penalties; 01 to 15 minutes after your check in time equals a 5 inch penalty, 16 minutes and beyond is a disqualification. Ties: Ties will be viewed by officials and if they can be broken by looking at how the fish were rounded, the officials will place the competitors accordingly. If there is still a tie, it will be broken by the best of three Rock/Paper/Scissors officiated by tournament officials. Polygraph: Each contestant may be required to submit to a polygraph examination at a time and location determined by the tournament director following the end of the competition. Failure to pass the polygraph will result in disqualification and forfeiture of any prizes. 9. ELIGIBLE FISH: This is the BronzeBack Classic so naturally anglers can only score Smallmouth Bass. Alive on a conventional rod and reel in a sporting manner. 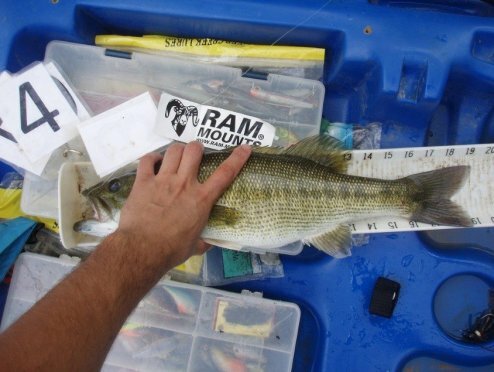 Only artificial lures may be used during competition. Commercially sold pork trailers or scents may be added and used. An intentional foul hooked fish may not be scored. If a fish misses your lure and gets hooked in the side then so be it, but if you are sight fishing and foul hook it then that fish cannot be scored. A foul hooked fish is defined as a fish that does not have at least one hook in its mouth, and it must be released. Anglers may not catch fish or weigh in fish that have been caged or confined in an area prior to the tournament. All fish must be caught during the hours of competition. Trolling and fly fishing are permitted. No cast nets allowed, but anglers may use a landing net. More than one rod can be in use at a time as long as it is in compliance with MN fishing rules and regulations. 11. ACCESSING THE RIVER: For ease of facilitation for all participants and staff, a shuttle up river is recommended and included in your entry fee. There is a reduced rate if you choose to do your own shuttling but do not plan on launching from our landing if you do not use our shuttle. All anglers using the CW Outfitting Shuttle must park at CW Outfitting and catch their time slot shuttle up river or launch from our landing at your time slot. A staff member will help the wave get ready at the river side and once the complete wave is ready to fish, you will be given the go ahead for the wave to start fishing. Waves will be staggered and each wave will have approximately the same amount of time to fish. 12. SAFETY: Safe boating will be observed at all times. During competition each contestant is required to comply with all state boating and fishing laws (files.dnr.state.mn.us/rlp/regulations/fishing/fishing2014.pdf). The tournament may be canceled due to unsafe weather or water conditions. The decision to cancel will be made by mid-day Friday, the day before the tournament. All participants will be notified immediately via the tournament page and Facebook page. If you have any concerns about weather call CW Outfitting. 13. COMMUNICATIONS: We encourage you to unplug and really enjoy the Wild and scenic stretch of The Mississippi River you will be fishing. The use of mobile communication devices such as cellular telephones, marine radios, walkie-talkies, CBs, pagers or any electronic device to communicate fishing information during tournament hours is strictly prohibited. Communication among anglers is allowed on the water only by non-electronic methods. Emergency calls may be made. Using social media to post your highlights, or lowlights, during the event is allowed but please use the hashtag #CWOMN. 14. AFTER TOURNAMENT AWARDS CEREMONY & PARTY: Starting approximately ½ hr after the last wave is in, we will have the awards ceremony followed by festivities. Food, drink and fun will be available after each wave gets off the water. *BIGGEST BronzeBack (single fish) will win a special prize plus entry into individual prizes if qualified. *INDIVIDUAL BronzeBack (most inches of 4 fish): If you place 1st you will have first choice of prizes, place 2nd you will have second choice, etc. until all prizes are gone. *OUR GOAL IS THAT ALL PARTICIPANTS WILL GO HOME WITH A PRIZE but will be dependent on sponsor participation. Contingency Prizes: Sponsors may at their discretion award contingency prizes for anglers winning or placing using their products. *Prizes are subject to change up to tournament start. See tournament web page for prize updates. **By accepting a prize, we expect you to pose for pictures to be sent to our generous sponsors. 15. SPORTSMANSHIP: This is all about having a good time on the river so it is important that all anglers adhere to a high standard of sportsmanship that portrays our sport in a positive light. All anglers will sign a statement of honor that they will abide by all the rules. If found guilty of intentional, predetermined cheating or in violation of the statement of honor, they are subject to be disqualified. Any angler may be subject to a polygraph test at any time to verify their catch and any other rules. If an angler is requested to take the test and chooses not to, it will result in their disqualification. Proper river etiquette should be adhered to while competing. Please be courteous of other anglers at all times. More details on this to come at pre-tournament meeting. 16. PROTEST: All protests must be submitted in writing to tournament director or dan@cwoutfitting.com along with a $100 deposit, within fifteen (15) minutes of the last angler check-in. The protester also agrees that if there is a question of verifying the charge of a protest that he or she also may be subject to take a polygraph and agree to testify in a court of law if necessary. If the tournament committee, or polygraph, upholds the protest, the cash deposit shall be returned to the contestant submitting the protest. If not the deposit is forfeited to CW Outfitting to pay for investigation costs. Even if there is not an official protest the rules committee will follow up on any accusations and there will be a serious price to pay if an angler has been found to purposely cheat. As mentioned above, fraud charges may be filed against the angler. 17. PHOTO/VIDEO RIGHTS: All photos, video, data, audio and angler profile information shall be used by CW Outfitting indefinitely and may be used by any of its tournament partners in future projects, promotions, articles or media releases. There will be no compensation for such use of these photos, video, voice or data. Anglers will be allowed to keep their photos/videos and use how they please as well. 18. FINAL DECISIONS: Any decisions that need to be made in relation to the event will be done so by the tournament committee and their decisions are final. 19. RELEASE OF LIABILITY AND COVENANT NOT TO SUE: all participants must sign a waiver, release of liability, and covenant not to sue before competing in any tournament. It is required that all participants take responsibility for themselves while participating in event activities. 20. HAVE FUN: Remember, winning is not something you can completely control, because there is no way to play defense in this sport. All you can control is your fishing and your attitude….so relax, have fun, and enjoy your time on the water. The tail can lay natural OR it can be pinched. Get the most out of the fish! Any stiff commercially sold ruler-board with a right angle end sticking up so the bass’s nose/lip can touch up against it. The measuring scale must be easily read in pictures. There will be measuring boards for sale at CW Outfitting prior to, and the day of, the tournament. Make sure you have one prior to your shuttle leaving. Some examples are Hawg Trough, Frabill bump board, Norhtland ruler scale board, Rapala tournament ruler, etc. Correct – Fish is facing to the left, nose touching the board, and the identifier is visible as well. Tail is in natural position and mouth is natural as well. Correct – Everything done right and you are allowed to use hand to stabilize the fish if it does not block the nose or tail. Incorrect – Fish’s nose/lip is not touching the end of the board and the angle is not directly over the fish. Incorrect – Fish’s tail is flopping while photo is taken. It must stay flat on the board. Incorrect – Need to see all of the board on the left side in the photo. Incorrect – No tournament “identifier” in the photo and nose/lip is not touching the end of the board. Incorrect – Fish is facing the wrong direction and upside down. They must face left and their bellies should be facing down (to the south, if you will).